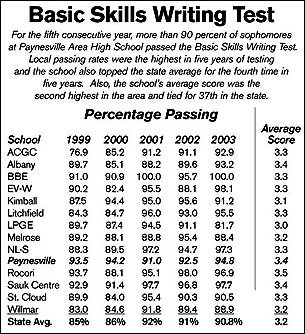 Sophomores at Paynesville Area High School passed the Basic Skills Writing Test in record numbers in 2003. Of the 97 sophomores at PAHS, 94.8 percent passed the test, which is the highest percentage of passage for Paynesville in the five-year history of the writing test. Students took the writing test in January, and results were released by the state this month. "I'm really proud of the students," said Amy Flanders, who teaches sophomore English classes at PAHS. "Part of doing well is being willing to try. This is a high-stakes test. It's needed for graduation. I'm sure that's a motivating factor." The 94.8 percent passage rate was the highest in school history, topping the 94.2 percent passage back in 2000. PAHS also topped the state average (90.8 percent) again. Seventeen school districts - including BBE - had 100 percent passage rates among sophomores who took the writing test. This year, the sophomores also recorded a school high for average score. Compositions are rated on a scale from zero to six, with scores of three and above passing. This year, PAHS students had an average score of 3.4, improving on the past two years when Paynesville sophomores have averaged 3.3. One school district had an average score of 3.7, six had averages of 3.6, 29 had averages of 3.5, and 55 school districts - including Albany, Paynesville, and Sauk Centre - had average scores of 3.4. Flanders said Paynesville's score might have been even higher but for the fact that only half of the sophomore class has studied more advanced techniques for writing by the time of the writing test in January. The English curriculum for sophomores includes a half year of literature, a quarter of speech, and a quarter of writing, but half the students study writing in the fall and the other half in the spring. PAHS sophomores did spend about a week reviewing for the writing test and also wrote practice tests last fall, which were graded by Flanders and reviewed with each student individually. One technique PAHS students are taught - throughout the English curriculum - is the five-paragraph style, which uses an introductory paragraph, three main points, and a conclusion. This basic style helps all students be organized for the test, according to Flanders, who credits all the students and all the members of the English department and other teachers for the high scores. This year's test asked students to describe their favorite place to play as a child and explain why it was. The writing test is untimed. Passage is required for graduation. Individual results have already been mailed to students.